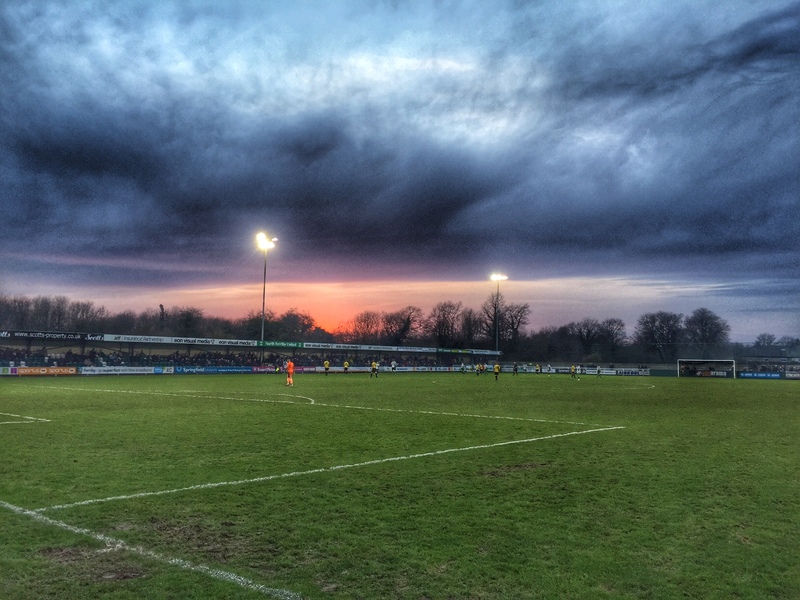 My footballing year started on New Year’s Day with a dilemma as to where to head to. AFC Goole or North Ferriby United. A toss of a coin some 362 days ago determined our destination for the first game on 2015, The Victoria Pleasure Grounds in Goole, where we watched a 1-1 draw against Lincoln United. Almost a year on and as we headed across The Humber Bridge we had the same options. That was until Northern Steve checked the Interweb and discovered that The Amateurs (Lincoln United for those unfamiliar with step 8 team nicknames) game at Goole had fallen foul to the weather. North Ferriby United v Bradford Park Avenue it was to be then. It’s been quite a year for The Villagers. Their penalty shoot out win over Wrexham at Wembley Stadium in the FA Trophy gained them national headlines, then just a few weeks later owners Eman and Steve Forster, Daughter and Son-in-Law of Hull City’s multi-millionaire owner Assem Allam announced they would be selling up, throwing the club into chaos. Their investment into the facilities and squad gave the club a clear advantage, allowing them to compete with clubs with much bigger resources. Their average attendance is just over the 300 mark and shows just how much the club has to fight to compete with the likes of Stockport County or FC United of Manchester who average crowds nearly 10 x the size. During the summer the owners had a change of heart, deciding to stay put and that appears to have spurred the team on to push for promotion to Conference National. Prior to this game they sat in 3rd place, just two points off the top of the table and on a decent run of form, although nobody wants to remind them about the defence of the trophy they proudly have on display at the ground, losing 2-1 in the FA Trophy First Round to Stocksbridge Park Steels from the Evostik League South. The first thing that strikes you driving into North Ferriby is that it is tiny. A one pub, two church village sitting on the banks of the Humber Estuary with a population of 3,893 to be precise and once the home to William Wilberforce. 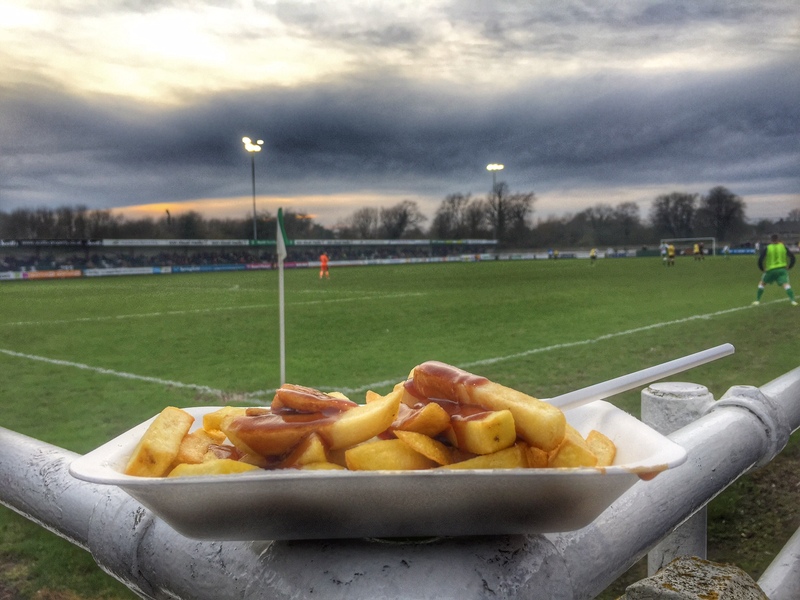 Wilberforce, a man who fought against all the odds to see his dream of a slave-free British empire come to pass, would certainly approve of the dogged approach The Villagers are taking to make their mark on Non-League football. The approach to the ground is still very county league – down an unlit lane alongside the allotments. After a brief visit to the club shop to pick up some Official North Ferriby fizzy rings, the smell from the snack bar enticed us. “Sorry luv’, we’ve not got any cheese for the cheesy chips. I can do you them with gravy but they won’t be called cheesy chips?” Who were we to moan? 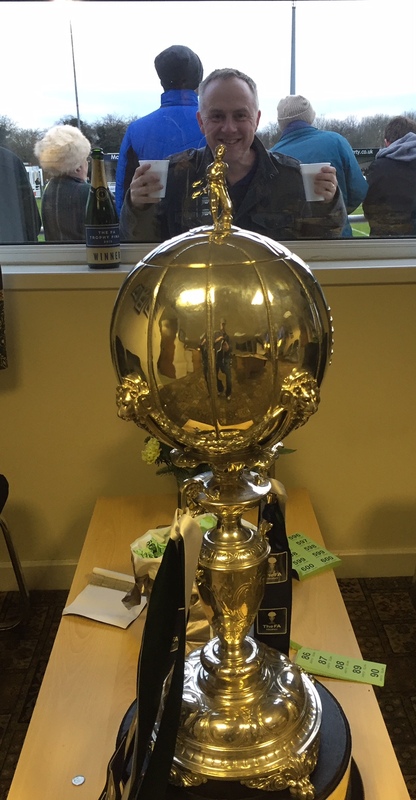 Pre-match got even better when we were invited into the boardroom to “meet” the FA Trophy himself, possibly the biggest football trophy I’ve ever got my hands on and approximately 7 times larger than the UEFA Intertoto Cup which is still on display in the boardroom at Upton Park. The crisp Humberside air was frequently punctuated by the rattle of a train passing above the far-side stand. Ironically, the last ground I went to where the game could be watched from a passing train carriage was Goole’s Victoria Pleasure Grounds. I’m sure there is a whole book out there somewhere, combining two of the least social past times. There was a decent crowd in for the visit of Bradford Park Avenue, although it appeared the visitors hadn’t brought any fans with them, until I realised Bradford normally played in green and white, the same colours as North Ferriby United. Bradford FC, as they are often referred to, are one of 35 clubs to have played in all four of the top tiers of English football, although they are along way from being able to compete at that level again. The original club which competed in the Football League were replaced by Cambridge United in 1970 after failing to gain re-election and folded a few years later. The new club have climbed up from the very bottom of the county league structure, and should be applauded for how far they have come, joining the Conference North in 2012. Formalities over, it was time to enjoy the final game of 2015, cup of tea in one hand, non-cheesy gravy soaked chip in the other. 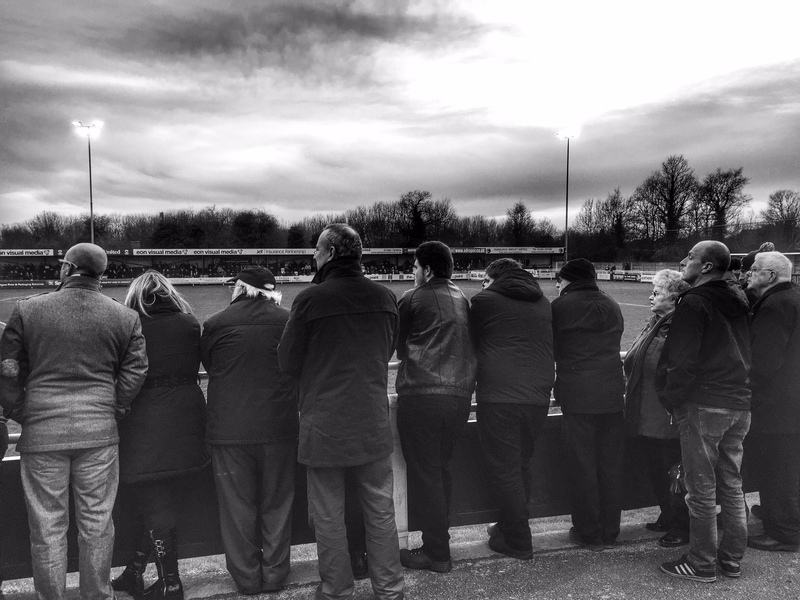 North Ferriby United 1 Bradford Park Avenue 0 – Grange Lane – Monday 28th December 2015 This was one of those games that for an hour seemed as if it was destined to be goal less. Despite the efforts of both teams, and the antics of both keepers, the goals seemed to be living charmed lives. It is always interesting watching other Non-League clubs and trying to assess how we would fare against them. North Ferriby’s centre-forward, the giant Tom Denton, may have looked like a stereotypical target man but the home side’s approach play was more subtle than that. Denton threw himself at everything and if I was allowed to bet on football I would have had a tenner on him being he opening scorer. Northern Steve, who can bet on football, suggested that it would be a waste of a tenner and backed Stoke City v Everton to have less than 1.5 goals. The second half saw both teams have chances in the opening exchanges. That man Denton should have done better when he was unmarked in the box but he put too much force into his downward header and it bounced over the bar. However, he was on target in he 64th minute, finishing off a superb run and cross from Middleton. Alas, the full back got himself sent off ten minutes later with a needless tackle from behind on the touchline that saw the referee brandish a second yellow. Despite having the one man advantage Bradford PA couldn’t breakdown the stubborn North Ferriby defence in the last 15 minutes and the final whistle brought relief more than anything from the 500 plus crowd, as well as three vital points in their push for the top spot. 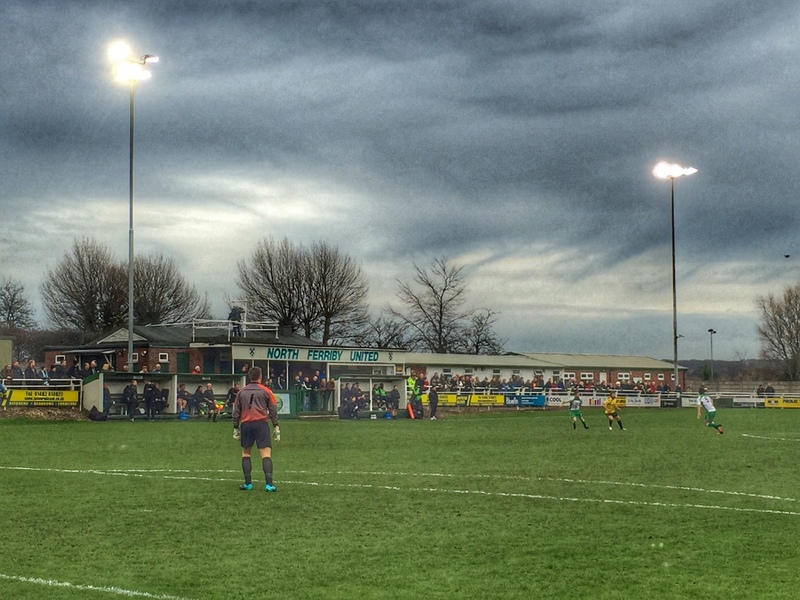 Despite the hype around the off-the-field set up at North Ferriby United you couldn’t visit a nicer club. Everyone we met seemed to be proud to work for the club and the danger here could actually be promotion to a higher level. Having seen what the step up actually means in terms on infrastructure for a club at this level I’m not sure they are ready for it yet. Having to handle the logistics for the visit of Stockport County and FC United of Manchester twice in a season is very different to having to arrange segregation and policing for every home game. But that’s the pay off for progress I guess.